While her pop-punk band remains on indefinite hiatus, former Hey Monday frontwoman Cassadee Pope attempts to re-start her career through the reality show strategy, having now been packaged into a country music star with a little help from The Voice. 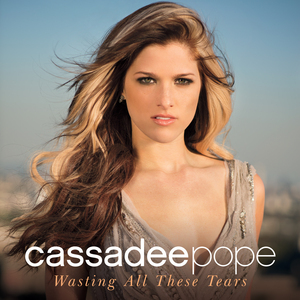 Her debut country single “Wasting All These Tears” is weighed down by problems that tend to be common among former reality show contestants, foremost among which is a failure to stay out of the way of the song. In listening to “Wasting All These Tears,” it’s disheartening to note just how irrelevant the actual song feels to the overall project. Her performance feels extremely disconnected as she hits the notes prettily, but with little personal flair or sense of first-person authenticity. As a listener, one doesn’t get the sense that she has any real emotional investment in the song. As she forgoes subtlety and nuance in favor of empty belting, it becomes all too clear that this is all about the singer. Besides the song itself being treated as a mere accessory, there’s too much clutter in the mix for “Wasting All These Tears” to work on any meaningful level as a vocal showcase. Screeching electric guitars and murky background vocals place needless barriers between Pope and her listeners, making it difficult to even understand the words she is singing. Unfortunately, a closer look at the lyrics shows a song riddled with odd unclear metaphors (“My loneliness was a rattle in the windows”) and trite phrases (“I’ll do everything I gotta do to get you off my mind”). The didactic, heavy-handed treatment all but kills off whatever potency the song might otherwise have carried. My main issue with this? She’s NOT a country singer and this is NOT a country song. I do like her voice, in an Avril Lavigne kind of way, but she’s not even close to being even remotely country. So, she’ll likely fit right in with current trends. Time for equal time to critique of Kree Harrison: “All Cried Out” To me she is a true country singer. I think “All Cried Out” should be getting a review on here soon, but I can’t say exactly when. Stay tuned! …on mtv’s ridiculousness this clip-category might be called “lost twang” or “no steelo in there”. it’s a funny thing, when opera tenors try to sing popular tunes for those, who aren’t pretending gettin’ what all the shoutin’ in italian is all about. i find that slightly condescending, but it is also kinda nice of them to try. however, when pop-folks – even with the most pompous basketball player names – go country by sounding country instrumentation for a ten second hillbilly-alibi at the beginning, i find it rather puzzling because it is really difficult to differentiate, who’s the real moron in those cases. having said that, not the worst tune and singer, actually. Will you also post a review for the debut single of Danielle Bradbery, the latest The Voice winner? Thanks! We’ll look into that, Lynn. Thanks for the input. I actually quite like the song, but I miss the Cassadee from The Voice. She had much more rawness about her then, which was far more engaging than hearing this now.